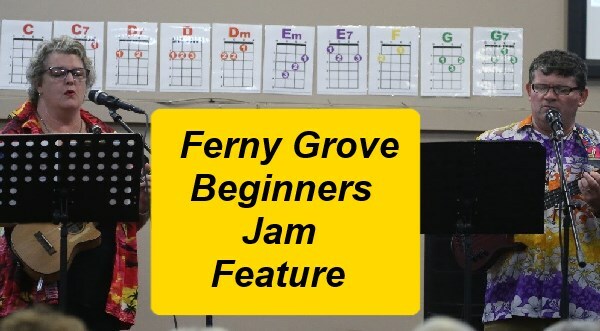 The next cab off the rank in our jam feature series is … FERNY GROVE JAM! 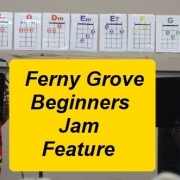 The Ferny Grove Beginners Jam will celebrate its 5 Year anniversary in May 2019. It goes from 7pm until 9pm on the 3rd Wednesday of every month. It was started by Paul Morris (from Morris Brothers) and Linda Gough (from Ivory Frets Music), and they’re still going strong – maybe 60 people there on 16 January. Andrew Hunt also deserves a mention for looking after the projector for the night. What did Santa give you for Christmas? Socks, you say? 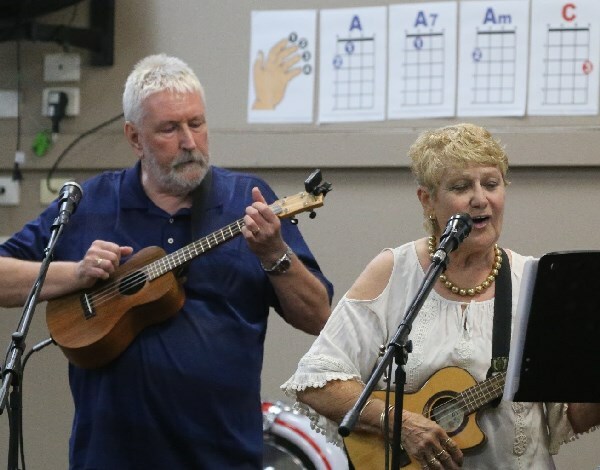 Well, I can tell you what Santa gave a lot of people who were at the Ferny Grove Jam on Wednesday night 16 January this year … a Ukulele! Donna teaching the beginners group the basics. That’s right folks. Donna Farrell had her hands full with many absolute beginners. I don’t know how she does it, but she had all these newcomers strumming away merrily and contributing to a song by the end of the session. Dianne Davis and Donna Farrell’s group gets underway at 6pm, before the main jam. 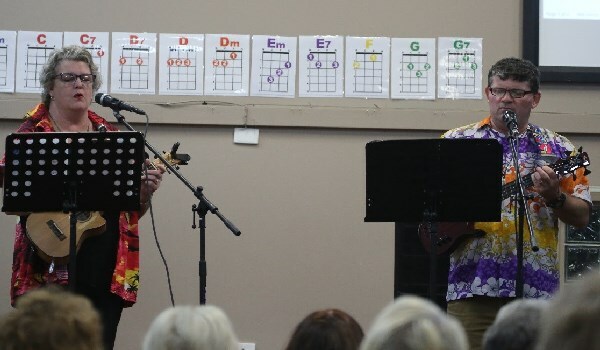 It will also come as no surprise that we did a couple of Slim Dusty songs – ‘Pub with no Beer’ and ‘Love to Have a Singalong with Paul and Linda’ (I just modified that to see if anyone reads this). To round off the Aussie theme, we also did Peter Allen’s evocative song from afar ‘I still Call Australia Home’, and James Blundell’s ‘Living and Working on the Land’. Some of these songs strike a poignant note with the hardships of drought and heatwave conditions in the bush that we have now. What makes a good selection of songs for a jam? Well, there surely has be variety and Paul and Linda put together a mixed bag of songs for a singalong: Some Rock ‘n Roll – ‘Twist and Shout’ and ‘Can’t Buy Me Love’ (The Beatles), ‘Rocking Robyn’ (written by Leon Rene), “Da Doo Ron Ron’ (The Crystals). Some pop with ‘Loco-Motion’ (Originally co-written by the inimitable Carole King), and ‘Ring, Ring’ (ABBA). Linda & Paul leading the jam. Note the chord charts on the wall behind them. And they also included a range of songs that test the tonsils: ‘Mull of Kintyre’ (Wings), ‘Top of the World’ (Carpenters), and ‘I Only Want to be With You’(Dusty Springfield). You could test if you could reach high notes in ‘Una Paloma Blanca’ (George Baker), particularly right at the end of the song where it goes up yet another level to Nitrogen giggle level (for me). There was also a couple of more challenging songs, including ‘Logical Song’ (Supertramp). This is a personal favourite of mine, but the original recording has lots of keyboard from Roger Hodgson and orchestration in the British rock tradition. It worked out a treat, which goes to show you can do just about anything on a uke if you know what you are doing. Donna and Derek Farrell also stretched themselves, both vocally (Donna) and finger-picking wise (Derek), with a cover of the Jazz standard ‘I Can’t Give you Anything But Love’ (John Lloyd Young) during a break. Singers of the pedigree of Billie Holliday, Ella Fitzgerald, Frank Sinatra, and Frankie Valli have recorded this song. It was a good night. I’m sure everyone who was there enjoyed themselves. 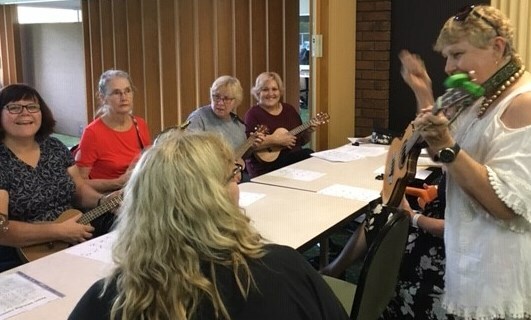 By the way, Linda’s Uke’n’Sing classes at the Ferny Grove Bowls Club will be beginning shortly. To find out more information, call 0431 391 888.